Type D Fire: This includes combustible metals and chemicals, and is usually found in chemical labs and industrial facilities. Apart from the above, there are also type K fires that involve cooking greases and oils and can easily be extinguished using a type B or a type C fire extinguisher. What are the General Codes on Fire Extinguishers in California? How Much Does It Cost To Have Fire Extinguishers Inspected California? Where Should You Have a Fire Extinguisher in California? What is the Fire Extinguisher Disposal Process in California? SHORT ANSWER: What Does California Law Say About Fire Extinguishers? IN-DEPTH: What Should I Know about the Code Governing Fire Extinguishers in California? The California code of regulations on fire extinguishers has many different facets. 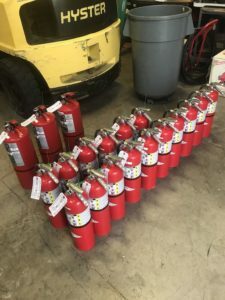 It covers how many fire extinguishers are required in California, how often do fire extinguishers need to be inspected, and much more. Essentially, employers are legally required to provide fire extinguishers. CCR (the California Code of Regulations) Title 8 – Section 6151 – contains certain details for the regulation of fire extinguisher standards in Orange County. 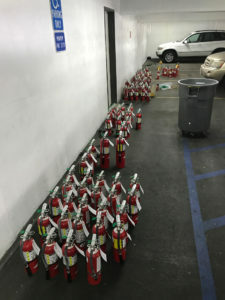 In the same way, Cal OSHA is a government agency charged with the responsibility of inspecting and enforcing these fire extinguisher requirements. This body frequently cites employers for the improper installation, recording keeping, employee training, and maintenance of fire extinguishers. To this end, if you are an employer, it is essential that you evaluate the fire sizes and hazards that are likely to occur in your workplace. You should also choose the capacity and type of fire extinguishers that you ought to provide for dealing with classes A through to D, as well as class K fires. You need to mount all fire extinguishers securely inside a cabinet or on a wall. It should be easy to access these extinguishers, in case of fire. To this end, there should be no storage materials or furniture blocking access to fire extinguishers. Additionally, you should provide training for all employees and building occupants on the locations of the fire extinguishers, as well as the evacuation maps (which should be properly marked with the various locations). Additionally, the California code on fire also requires regular testing, maintenance, and inspection of fire extinguishers. This means that you should ensure all your fire extinguishers are fully charged and that they are in working condition. When you remove the equipment for service, you should provide equivalent equipment in their place. It is also mandatory that you get an annual recharge and maintenance check, which should be performed by a trained and certified company/individual. To ensure that they work optimally, it is also essential that you perform hydrostatic testing after every 5 or 12 years using the right testing facilities and equipment. After that, ensure that the periodic testing and annual service are documented on the service tag for each fire extinguisher. Additionally, the California code requires that you get your fire extinguishers inspected every month. 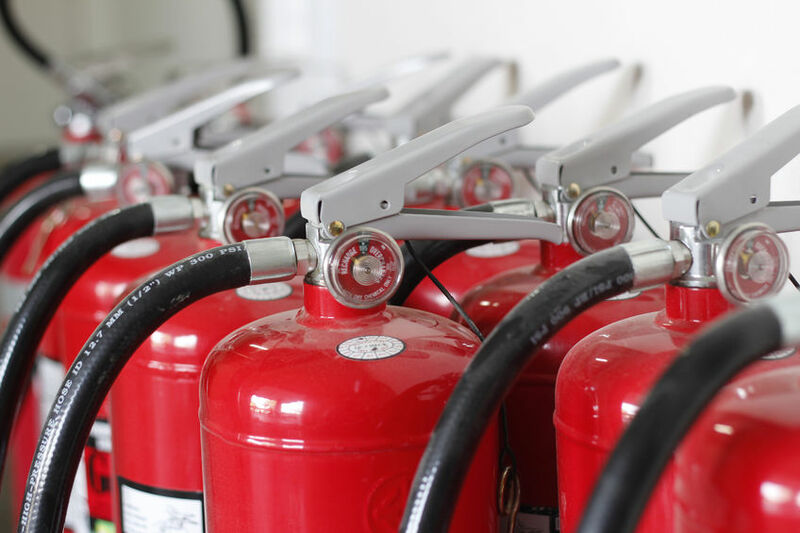 The inspection should ensure that the fire extinguishers are free of dents, signs of damage, and leaks and that they can be operated correctly. The pressure gauge arrows, on the other hand, should be in the green charged zone while the inspector’s initials and the date of inspection must be marked on the service tag. You must ensure that your employees are trained on fire hazards. The training needs to cover the basic principles of using fire extinguishers, the hazards that are typically involved with firefighting and more. Similarly, training ought to include the process for reporting a fire, how to evaluate the size of a fire, how to use a fire extinguisher, as well as keeping the exit route in good condition. This training must be provided to every new employee, for employees assigned to emergency response teams, and to all other employees on an annual basis. The records for the training must be recorded and documented. TAKE-AWAY: The above also applies to residential fire regulations in Orange County California, and tenants, as well as the other inhabitants of a building. Everyone should be trained on how to handle fires, meet at designated locations in case of a fire, and how to use fire extinguishers when and as required. How Much Does It Cost To Have Fire Extinguishers Installed and Inspected in California? SHORT ANSWER: What is the Cost of a Fire Extinguisher in California? IN-DEPTH: How Much Will It Cost Me to Install and Inspect a Fire Extinguisher in California? In general, the inspection tag for your fire extinguisher will contain essential information about the contents. Today, fire extinguishers are some of the standard features in many private homes and public buildings in Orange County California. One of the best ways to ensure that they work properly when and as needed is to follow basic California inspection standards and schedules. The inspections, to this end, should be recorded on the hang tag that is normally found on a fire extinguisher. Apart from the list of the dates of inspections, the tags should include descriptions of the fire extinguishers – such details as to model number and make. Most safety inspections will require that you check to ensure that each fire extinguisher has a tag, and the tag contains accurate and up to date information. Even in Orange County California, there are basic federal requirements that outline the inspection of fire extinguishers. These requirements are specified in NFPA 10 – the Standard for Fire Extinguishers by the National Fire Protection Agency. There are additional standards in various California state codes and OSHA codes. These inspections, as earlier noted, should be recorded on the tags on your extinguisher. If possible, you might want to keep your own separate inspection log just in case the tags get lost or burned during a fire outbreak. 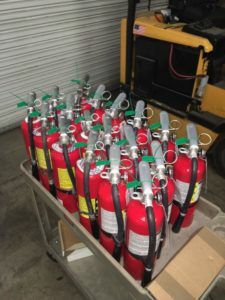 Essentially, inspections conducted monthly as well as annually are the best way to make sure that your fire extinguishers are operational and mounted/stored properly. Monthly inspections, however, are only visual ones that you can perform, or get the safety and maintenance personnel in your building to perform one. These monthly inspections will ensure that your fire extinguishers are undamaged, there is no blockage in the hose, the safety seal has not broken, and that people can read the operational instructions. The inspection should include checks on the pressure gauge to find out whether the extinguisher is fully charged. Last but not least, the date of the inspection, as well as the initials of the people who performed them, should be recorded on the hang tag on your fire extinguishers. Yearly inspections, on the other hand, tend to be more thorough. As such, they can only be performed (and certified) by professionals especially because they include examining the mechanical parts, the delivery system, and the fire suppression agent. Certification of the annual maintenance inspection should also be recorded on the tag on your fire extinguishers – including the initials of the inspector as well as the inspection date. These are pretty much the same as annual inspections. However, there is a difference in the sense that the contents of any stored pressure extinguisher will be emptied. During the inspection, you should get a licensed professional to examine the fire extinguishers mechanics, delivery system, and outlet hose. After that, the extinguisher will be refilled, depressurized, and marked using a tamper resistant seal. Like with any other inspection, you should ensure that the 6-year inspection is clearly recorded on the hang tag as well as on the metallic label attached to your fire extinguishers. These inspections should be carried out at different intervals. Wet-chemical, carbon dioxide, and pressurized water fire extinguishers require inspection after 5 years while extinguishers containing dry chemical should be inspected after every 12 years. Hydrostatic material inspection typically uses water (or any other liquid) to pressurize the cylinder to check if it still meets basic factory standards. It must also be performed by a licensed professional who has been trained to handle the agents in the extinguisher. The inspector should recharge your fire extinguishers and seal them after the testing has been completed. The inspection should be recorded on the hang and metal tag on your cylinder. But what should your fire extinguishers have? Essentially, most extinguishers contain a rating sticker (to show the fire types it can fight), pressure gauge, metal (rechargeable) or plastic (single use) head and valve, and UL listed marks indicating that it meets safety guidelines. Some manufacturers will offer a warranty of between 10 and 12 years. You can recharge or refill your fire extinguishers at your local fire station in Orange County. However, if the service is unavailable, the station will refer you to another location. This will cost you anywhere from $15 to $20. Getting a wall mount for your fire extinguishers will set you back anywhere between $5 and $100. On the other hand, the signs for fire extinguishers cost between $3 and $15. TAKE-AWAY: As you can see, the prices of different types of fire extinguishers vary greatly. This is also the case with the cost of getting inspections on these different types of extinguishers. SHORT ANSWER: Which Locations Require a Fire Extinguisher? IN-DEPTH: Where Do I Need a Fire Extinguisher? What type of fire extinguishers must placarded vehicles carry in the state of California? Are fire extinguishers required in rental properties in California? Are landlords required to provide fire extinguishers in California? What are the laws for outside fire extinguishers in planned condo developments in California? What are the requirements of fire extinguishers for construction sites California? Which laws for outside fire extinguishers in planned developments apply in California? Do fire extinguishers need to be enclosed in California public schools? How many fire extinguishers are needed in a retail space in California? According to Cal OSHA Act (the Californian occupational safety and health act) for instance, companies that have more than 10 employees must provide clear fire emergency exists plans and prevention strategies for every workplace. If your company has less than this number of employees, you may orally communicate the plans. There is also a separate Cal OSHA regulation for governing the use of fire extinguishers. It stipulates that employers should ensure that there are approved extinguishers in areas that the employees can easily access. These extinguishers, for instance, should be placed near the exits to reduce the risk that people will be trapped by fire inside the building. TAKE-AWAY: To this end, almost every location that isn’t fully open or away from the potential for fire requires fire extinguishers. This is designed to reduce the occurrence and spread of fires, as well as the risks and dangers that this poses. SHORT ANSWER: What is the Right Disposal Procedure for a Fire Extinguisher? IN-DEPTH: How Should I Dispose of My Fire Extinguisher? Last but not least, it is essential that you understand how to dispose of fire extinguishers in Orange County California. As you well know, every home and workplace requires fire extinguishers – particularly in dangerous locations such as the garage and kitchen, as well as near any outdoor grill. Since these devices are based on the types of fire they can quell, you should ensure that you have the right one. The rating system on the fire extinguishers will also have a large bearing on how you should dispose of it. You might want to check with your local Orange County fire department of government for more details about the laws that have been put down to govern the disposal of fire extinguishers. Irrespective of what the fire extinguishers originally contained, you can be sure that all that are made of metal can be recharged or refilled whenever required. Before recharging, it will get a once over to make sure that it is still working and meets all current requirements for operation and construction. Today, you can easily get a refill for about $15 – which will cost you less than replacing the fire extinguisher. Refilling is typically handled by Orange County fire departments and recharging companies. Most fire extinguishers are made of steel, which is recyclable. After you empty the cylinder, you should squeeze the trigger to make sure that it has no pressure. Then, remove the trigger and plastic top. You can sell the canister to any recycling facility that has the capacity to process steel. In case the fire extinguisher is still partly full, you can get a fire company to discharge it safely first. Last but not least, you may want to check whether your local Orange County waste management facility accepts discharged extinguishers in household trash. In case there is pressure on the gauge, take the cylinder out and squeeze the trigger to release the pressure. Let the fire extinguisher sit for one day or two to ensure that it is fully discharged before you wrap it inside your trash back and dispose of with ordinary household trash. TAKE-AWAY: As always, you should be careful while disposing and handling old fire extinguishers. You can also sell yours to a collector if it was made before 1960 – although you should also handle it carefully. Overall, a fire extinguisher is a valuable tool for protecting property and life – but only if you use it correctly. These devices are designed to completely extinguish small fires and slow down the progress of larger fires – which will come in handy until your local fire department arrives. If you live in Orange County and would like more information on fire extinguishers and general fire safety, please get in touch with us through (949)770-5371, emailing us on info@cafireprotection.com, or by filling in the form at http://www.cafireprotection.com/contact/.